Homemade street sign constructed of a 2" by 4" piece of wood and two rectangular-shaped pieces of plywood. 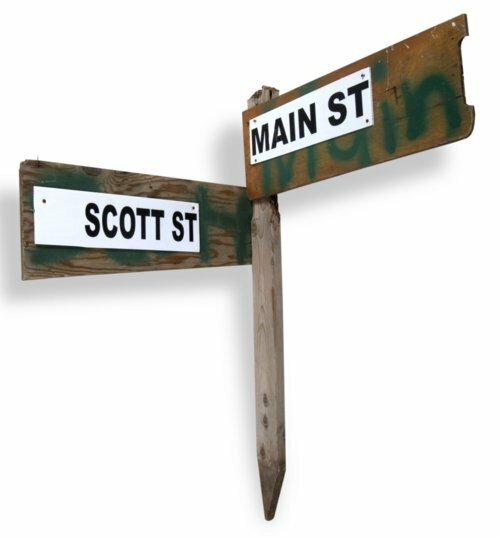 Street names (Main and Scott) are spray painted in green on plywood (both front and back). Rectangular pieces of white coreplast, with names printed in large, computer-generated black letters, are nailed over the spray painted names. This street sign was put up by the City of Greensburg, Kansas, after the town was struck by an EF5 tornado on May 4, 2007. The tornado was 1.7 miles wide and traveled over 20 miles. Ninety-five percent of Greensburg was destroyed. These signs were used temporarily until permanent signs could be put into place. Since the tornado, the citizens have focused on rebuilding the town to be more environmentally sustainable.